Banana Bread with honey and applesauce instead of sugar & oil. Delicious & Healthy! Banana bread does not last long in my house! 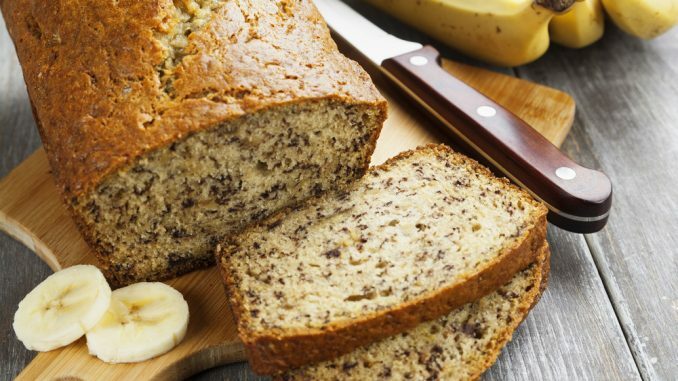 Warm banana bread with a little butter is absolute comfort food for me. I make this lighter version now and I know it’s a hit because it vanishes just as quickly as ever! Stir banana mixture into flour mixture; stir just to moisten. Bake in preheated oven for 60 to 65 minutes – until a toothpick inserted into center of the loaf comes out clean.